Here I am at the KKIA waiting for my flight home to Kuching. Been here for the last 2 hours and I have another hour to wait. So, here I am posting another wire wrapped piece which I have been wanting to post the last few days but interrupted by this travelling. 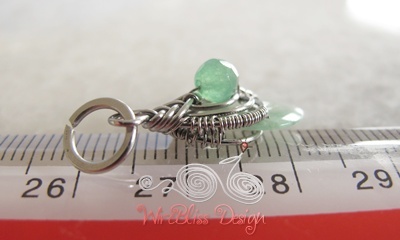 This is a very tiny donut jade pendant. 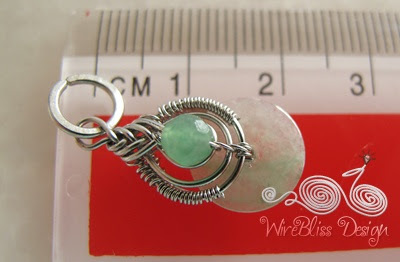 The donut jade itself is only about 1 cm in diameter. A custom order by a close friend of MIL. Had hard time figuring out how to wrap it and in the end decided that the pipa wrap would be the safest besides adding size to the tiny jade. 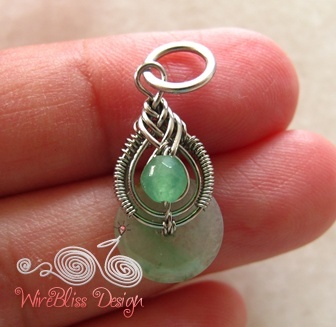 All through the making of this pendant, I was worried that I am going to break the jade. Its so delicate but thankfully it didn't happen. Gorgeous pendant Mei...as always the wire work is amazing!!! Hope you flight was uneventful! I reached home at 1am. Was still raining but the wind was gone. Before that, we approached the runway twice but after the second try, we were diverted to another airport about an hour away. It was scary especially when the plane "climbed up" suddenly. Just glad that I am home in one piece.